PaseoSoft develops freeware for the community, the high-power development tool that lets you control graphically all technologies and applications. Generate your operational scripts in a few clicks ; Drive them through command mode or dotnet API. For the IT manager community.You can control your scripts directly, either via your scheduling application or using the "Paseo Cockpit" scheduler included in the Enterprise version of PaseoExpress. * Analyze and consolidate logs, etc. Scripts can be run either in local command mode or remotely. 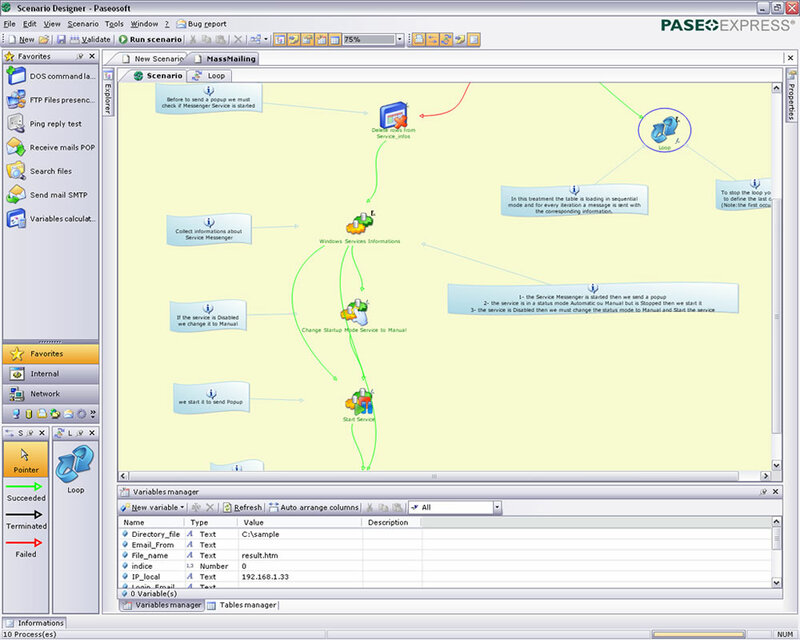 You can control your scripts directly, either via your scheduling application or using the "Paseo Cockpit" scheduler included in the Enterprise version of PaseoExpress. Using the PaseoExpress platform revolutionizes the way IT operations managers work, allowing them to divide script development times by a factor of 10 while delivering unmatched functionality. The industry-leading label design, cards printing and RFID software. Qweas is providing links to PaseoExpress Community Edition 0.9.1.87 as a courtesy, and makes no representations regarding PaseoExpress Community Edition or any other applications or any information related thereto. Any questions, complaints or claims regarding this application PaseoExpress Community Edition 0.9.1.87 must be directed to the appropriate software vendor. You may click the publisher link of PaseoExpress Community Edition on the top of this page to get more details about the vendor.